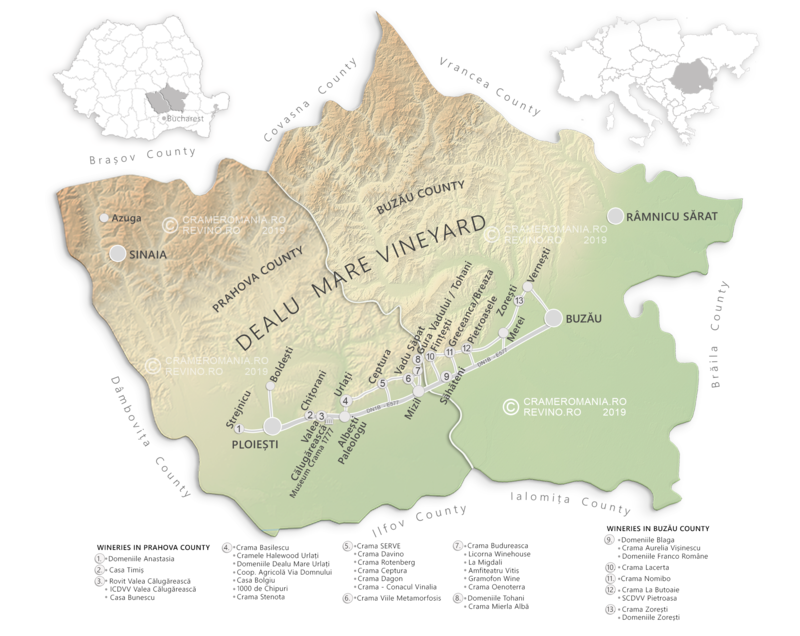 The Wine Road - Dealu Mare Vineyard, Why Romania? Dealu Mare vineyard, the most compact wine region in Romania, is situated on the Southern Subcarpathian hills, covering hills and valleys located between the river Teleajen to the west and the river Buzau to east, on the territories of Prahova and Buzau counties, between parallels 44°59′ – 45°32′ north latitude and 26°02′ – 27°00′ east longitude. The massif vineyard stretches over a length of about 65 km and has a width ranging between 3 and 12 km and with 15 000 hectares of grapevines. The existence of vines on this territory is confirmed by archaeological excavations, pottery remains and the toponymy which confirms the presence of vineyards in ancient times. The first written documents related to the existence of vine culture in this part of the country dates back to the fourteenth and fifteenth centuries. Over the years, the culture of grapevine has become a tradition that has been passed from generation to generation, being part of the lifestyle of wine growers villages. Vineyards represent a strive to add economic value to the less fertile land of hills. The western part of the Dealu Mare massif presents soils formed on red argils, marlstone and in a lower proportion on fine reddish sands and have a high content of iron oxide, which is remarkably suitable for cultivating red wine varieties. Soils in the eastern part of the massif are based on Sarmatian limestones, clays, sandstones and dacitic tuffs, fine sand deposits alternating with gravel composed of fragments of crystalline rocks, loams and löess. As a genetic type, prevailing on the west, we find the weathered reddish-brown forest soils and in the east rendzina, pseudo-rendzina and, to a lesser extent, the solidified sandy soils. 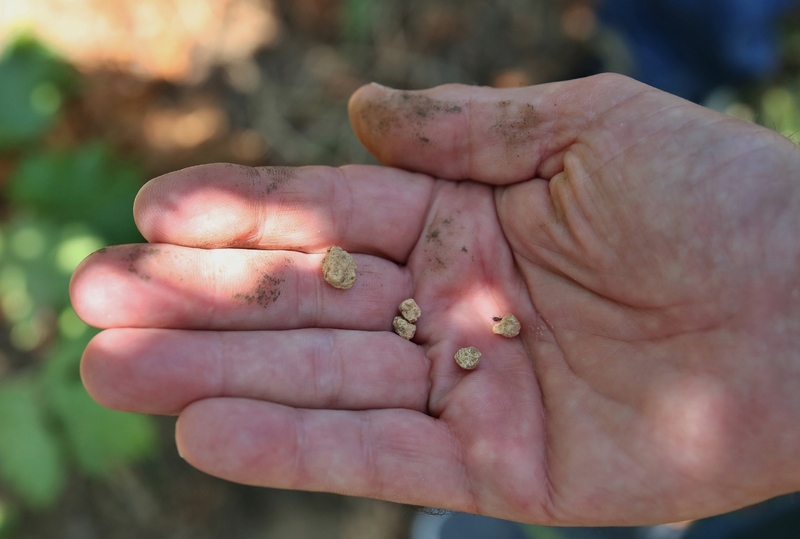 In some centers there are skeletal soils with a shallow bedrock and with a high content of calcium carbonate, which favors the production of aromatic wines. Towards the plain, there are rich black chernozemic soils, and in the northern part there are brown forest soils. With a exposure predominantly towards south, south–east, and south–west, the Dealu Mare massif has altitudes ranges from 134-170 meters towards the plain, and 460-550 meters in the higher hills. The vineyard benefits from the shelter provided by the Carpathian hills, which gradually increase in altitude, forming a shield against the cold draft coming from north, north – west and north – east. Winters are relatively short, and the cold becomes more intense in January and also in the first half of February. On the hill, the minimum temperatures are higher by about 3°C than on the plain, and the frequency of cold winters is much lower. Therefore vineyards planted on the hill can overwinter without danger of freezing. Due to the high number of hours of sunshine, a good ripening of the fruit and vine wood is favored. S.E.R.V.E (Societatea Euro Romana de Vinuri de Exceptie)﻿, the first private wine-growing company in Romania, was founded in 1994, when the first bottle of﻿﻿ „Vinul Cavalerului” came out, followed by „Terra Romana” selection distributed exclusively in HoReCa and on foreign markets. S.E.R.V.E. Winery organizes wine tastings at the winery, winery visits and/or vineyard visits guided by the winery’s representative, for groups of 10 to 35 people. The costs vary from 60 – 75 lei per person. Domeniile Sahateni - Aurelia Visinescu Winery “It is a domain that depends on the grace of nature, but evolves thanks to the skill and passion of the viticulturists and winemakers. Wine is what we offer you at our best, every year, from our cellar”. The winery is open to every wine lover, who made a reservation in advance and a 5 premium wines tasting accompanied by a cold platter can cost up to 85 lei per person. Basilescu Winery – the vineyards, manor house and the new winery established in 2008 represents today the place where old traditions find modern bonds. The philosophy of Basilescu Winery is based upon the valorization of the uniqueness of the terroir, expressed through soil, climate, land plots positioning, cultivated grape varieties and wine-making technology.The winery can be visited with reservations made in advance. They offer wine tastings and the cost for a 5 wines tasting is between 50 – 80 lei per person. Licorna Winehouse was opened in 2013, but the history of the place goes back long before Licorna became an inspiration for the name. The majestic house was built between 1907-1909 and it belonged to Nicolau family. The winery can be visited with reservations made in advance. The tasting of 5 wines together with neutralizers, cheese and cold cuts can cost up to 100 lei per person. Dacilor Farm is located in Tohani village, Gura Vadului, Prahova County, and offers its guests a restaurant with a capacity of 120 people﻿ and accommodation in 8 double rooms, 6 twin rooms and 4 "Tree houses"﻿. For larger groups, accommodation capacity can be increased by another 30 places - situated 7 kilometers away- in Mizil. The farm can transport visitors in this case between these two locations. In addition to the delicious traditional Romanian dishes, locally produced ​​from natural ingredients,﻿ Dacilor Farm offers a lot of activities for all tastes. „The Wine Cellar 1777” Museum (Muzeul Crama de lemn 1777) is a reproduction of the oldest wineries dated to 1777, which was maintained in its original form until 1985. The carved oak girders construction has a shingled roof. Inside one can discover old tools and machineries used in the winemaking process. In the cellar there are noble local wines kept for aging, and in the deep basement, on long wooden tables, sit old clay pots dating back to 1789. The mansard hosts an ethnographic exhibition titled "The Twigs of Life". Built in a time whose romantic scent travels the age up to us, situated in a enchanting framework, carrying a name forever linked to important creators of culture, the „Bellu Mansion” is more than an architectural monument, it is a monument of the Romanian soul. The mansion is completed with a noble cellar with rock carved pieces from the second and third centuries and other tools and pots used in winemaking from the oldests times and up to today. The domain and the mansion belonged to the famous art collector, Baron Alexandru Bellu (1850 - 1921), known then as an artist, photographer, numismatic, scholar. In order to enjoy the alignment of children carved rocks, one must walk on the slippery and steep paths and take in the spectacular view over the Bucegi, Ciucaș, Buzău and Vrancea Mountains. The Stone church (Biserica dintr-o piatra) was built in 2008 at an altitude of 600 meters and it is entirely built from soft limestone, extracted from the neighboring mine, the same white limestone used to build The House Of People in Bucharest. The Small Mud Volcanoes (Vulcanii noroiosi) is a protected area, a geological natural reservation of 30 acres. The mud volcanoes are located in the Sub Carpathians of Curvature, in Berca commune, Buzău county. They are formed due to gas eruptions from the ground which push mud and water to the surface. The mud volcanoes have the same structure as real volcanoes; similar processes are being produced inside them. They are no more than 5-6 meters high, and the deepness from which the „lava” is thrown is a lot lower. The result is a mostly aride surface.